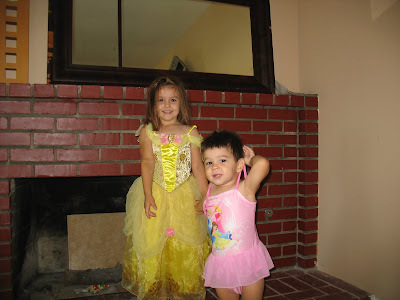 The OC Mama: Wordless Wednesday- My two daughters? Edited: My husband just called and told me to take this post down. LOL Apparently he doesn't think it's fair to our son to post such pictures on the net. Sorry honey, it's not coming down today. Maybe tomorrow. Oh yes, my son is only seven weeks old and he's already had princess crowns on, bows in his hair, and necklaces on! I think it's a requirement of 'little brother' title! LOL my hubs would flip! 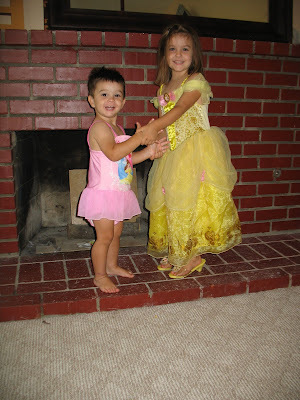 Do you remember the picture of Ryan in a tiara and Haley's princess tutu? (Looking at himself in a mirror..) I love that picture! 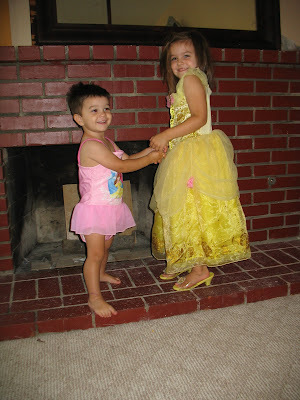 We dressed my Nephew up as a girl for his 1st Halloween..It was before my Niece came along..lol..poor thing. My Grandpa got sooo mad at us..he went out and bought him a pirate costume and changed him when he was in his care. Lol.